One of the questions I am most often asked about football is how much of the game is luck and how much of it is skill. Just how much of a game can be put down to randomness? We all know there is skill in football. Just look at Lionel Messi, Thomas Muller, Cristiano Ronaldo, Zlatan Ibrahimovic and Wayne Rooney. These players have made big differences in big matches, on many different occasions throughout their careers. Their long-term success isn’t just because they are lucky. But there is luck in football, both good and bad. Up until this summer, Cristiano Ronaldo had never won a major international tournament. And at the Euros he could consider himself lucky that Portugal weren’t knocked out in their qualifying group. The team went on to win the whole tournament, even after the apparent bad luck of having Ronaldo injured in the final. One of the places we see randomness most clearly is in goal chances. Consider a striker one on one with the goalkeeper. If the forward scores it may appear as if he skilfully placed it past the goalkeeper, and if the keeper makes a save it may appear that he anticipated the strikers shot. But these interpretations ignore the fact that the final outcome arises from very small differences in what the players do. Sometimes a shot will bounce under the keeper and on another occasion he will get a hand to the ball. Both the goalkeeper and the striker are highly skilled, but the final outcome contains an important element of luck. HOW MANY GOALS WILL CITY SCORE AGAINST EVERTON? So we understand that there is both randomness and skill in football, but this doesn’t answer the question. How much of a football match is random? To answer this, let’s assume that we think that Manchester City are twice as likely to score as Everton in their upcoming match. If there was no luck involved, let’s imagine we expect City to score 2 goals at home against Everton and we would expect Everton to score 1 goal away to Manchester City. Betting all our cash on 2–1 to City would not be particularly smart, because this doesn’t account for randomness. Instead, most bookmakers and professional gamblers use a mathematical model called Poisson distributed random numbers to model match outcomes. They start with an assumption about skill (like our assumption that City are twice as likely to score as Everton) and then use the Poisson model to capture the randomness (see ‘Geek Box’). Below is a Poisson simulation of the outcome of next Saturday’s match. 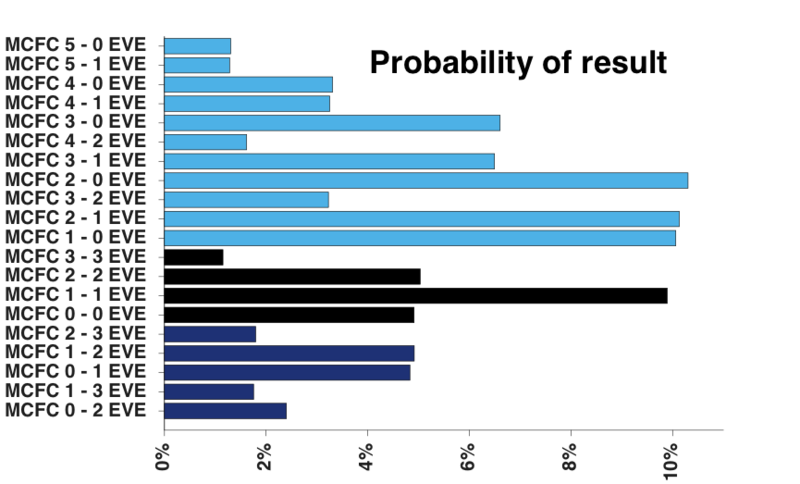 Each row shows the probability of each match outcome. The first thing to notice is that the probability of a 2–1 score line is only 10%. Even if our assumption about the skill levels of the two teams is correct, we expect that 90% of the time a different score will occur. The model predicts that City will win with probability 61%, Everton will win with probability 18% and the match will end in a draw with probability 21%. Roughly speaking, the difference between the outcomes of the two teams, 61% minus 18% equals 43%, gives a measure of how much of the match outcome is determined by the difference in skill between the two teams. The other 57% of the match outcome comes down to luck. The current odds, Manchester City are 1.49 to win the game while Everton are 6.95. That means City will roughly win two out of three matches between the two teams. I have used a simulation to break down a match in to its components of luck and skill. The real challenge however is estimating the skill levels of different teams. Are we right in saying City are twice as good as Everton, or are the bookies right when they rate City as three times as good? Through this series of articles we’ll look at ways of measuring teams’ skill levels. Even if nearly 60% of a match is down to luck, being able to identify the 40% that is skill can give us a genuine edge. Poisson distributed random numbers are the simplest way to simulate a football match. And they work! The model is based on the idea that goal events are independent of each other and equally likely to occur at any time during a match. In practice, this is quite close to the truth: there is no particular time point during matches that goals are more likely to go in. The parameter λ does not need to be an integer. For example, Manchester City have scored an average of λ = 2.57 goals per match so far this season, which would give a reasonable estimate of their scoring rate. While the Poisson distribution is a starting point, it isn’t quite right. Bookmakers and professional gamblers carefully study draw distributions and the tendency of teams with a big lead to defend, in order to improve the basic model. But as a starting point the Poisson distribution is the thing to use.